Bangkok Airways is planning to open an ATR 72 turboprop base in Chiang Mai in 4Q2014 which will be used to launch two new routes to Myanmar as well as new domestic sectors. The new base will be opened as Bangkok Airways starts to transition its ATR 72 fleet from the -500 to new generation -600 model. The carrier is planning to acquire three more ATR 72-600s, adding to its earlier order for six of the type. The new Chiang Mai to Yangon and Mandalay services will give Bangkok Airways five routes to Myanmar. Bangkok Airways has already become the largest foreign carrier in Myanmar, with three routes and 40 weekly frequencies. This is the second in a series of analysis reports on Bangkok Airways. The first report examined the carrier’s overall outlook and strategy, including the deployment plans for the four A320 family aircraft being added to the fleet over the remaining seven months of 2014, as it makes a second attempt at an initial public offering (IPO). Bangkok Airways decided in 2013 to renew its turboprop fleet by acquiring six ATR 72-600s to replace its eight ATR 72-500s. At the Singapore Airshow in Feb-2014 the carrier confirmed a deal with ATR as it placed an order for six ATR 72-600s for delivery from Nov-2014. The carrier’s fleet plan initially envisioned a reduction in its turboprop fleet from eight to six aircraft as it transitioned to the ATR 72-600. This was to be achieved by up-gauging some of its current ATR 72-500 routes to A319s. Bangkok Airways has not grown its ATR fleet in several years and has been gradually up-gauging turboprop flights to A319s although it also has taken the opportunity to use turboprops to launch new routes such as Bangkok-Nay Pyi Taw. Bangkok Airways president Capt Puttipong Prasarttong-Osoth told CAPA on the sidelines of the 2-Jun-2014 IATA annual general meeting in Doha that its turboprop fleet plan was recently revised and the carrier now plans to acquire nine ATR 72-600s as it sees opportunities to grow its turboprop network. He says three additional aircraft will be acquired by converting the two options from its original order with ATR and placing one new order. All nine aircraft are expected to be delivered by the end of 2016, at which point the last of the eight ATR 72-500s will be retired. Bangkok Airways currently expects to receive its first ATR 72-600 in Nov-2014, followed by three aircraft in 2015 and the remaining five aircraft in 2016. The existing ATR 72-500 fleet is expected to be phased out by the end of 2016. Bangkok Airways now operates its ATR 72s from Bangkok and Samui but is planning to open a new turboprop base at Chiang Mai in 4Q2014. Opportunities in the fast-growing Thailand-Myanmar market are the main driver of the carrier’s decision to open a turboprop base at Chiang Mai and increase the number of turboprops in its fleet plan. The carrier is planning to launch ATR 72 services from Chiang Mai to both Mandalay and Yangon in late Oct-2014. Mandalay will initially be served with three weekly flights and Yangon with four weekly flights but Bangkok Airways is confident both markets will grow and eventually be able to support more frequencies. Other secondary routes between Thailand and Myanmar are likely to follow as passenger traffic between the neighbouring countries is growing rapidly and is likely to accelerate after the current visa requirements are lifted. Myanmar and Thailand announced in late 2013 the lifting of visa requirements. Implementation has since been delayed, likely due to the political upheaval in Thailand, but is still expected. Demand for short flights from secondary Thai cities near the Myanmar border such as Chiang Mai is expected to grow particularly fast as the current visa restriction will remain in place for land crossings. Turboprops are the ideal aircraft for such short routes and for seeding new markets. Currently the Chiang Mai-Yangon route is served only by two weekly frequencies from Burmese carrier Air Bagan (also with ATR 72s) while there are no non-stop flights between Chiang Mai and Mandalay. 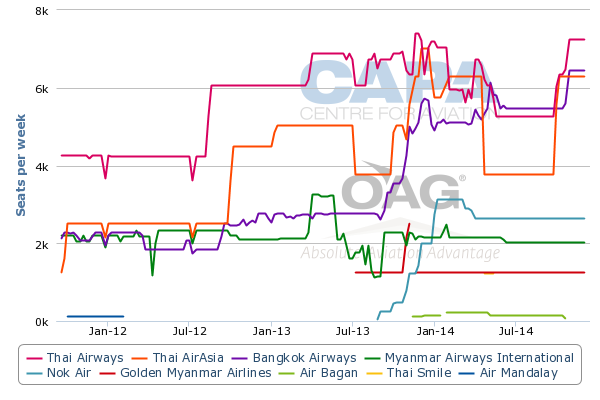 The new Chiang Mai-Myanmar routes are part of a broader push by Bangkok Airways into the Myanmar market, where it is now the largest foreign carrier based on weekly seat capacity, according to CAPA and OAG data. Bangkok Airways currently offers almost 11,000 weekly seats to and from Myanmar, making it the largest carrier in Myanmar’s international market with about a 10% share of total seat capacity. Bangkok Airways has roughly doubled its capacity to Myanmar over the past year as it added a fourth daily flight on Bangkok-Yangon and launched services from Bangkok to Mandalay and Nay Pyi Taw. Capacity is slated to increase by about another 18% in late Oct-2014 as Bangkok Airways adds a fifth daily flight on Bangkok-Yangon and launches Chiang Mai-Yangon and Chiang Mai-Mandalay. Bangkok-Mandalay and Bangkok-Nay Pyi Taw for now is slated to continue to be served with seven and five weekly frequencies respectively. Bangkok-Mandalay is served with A319s while Bangkok-Nay Pyi Taw is generally served with ATR 72s but A319s have been used during peak periods. 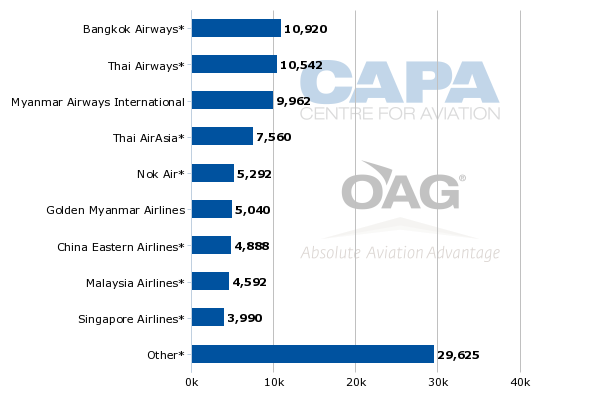 Bangkok Airways will have about 13,000 weekly seats in Myanmar in Nov-2014, accounting for 25% of the carrier’s total international seat capacity. Based on current forward schedules Thai Airways will increase seat capacity in Myanmar to about 14,500 seats but this includes about 2,400 weekly seats from regional subsidiary Thai Smile. On purely a carrier rather than group basis Bangkok Airways is slated to continue holding the distinction of being the largest airline in Myanmar’s international market by a narrow margin, with about 13,000 weekly seats in Nov-2014 compared to about 12,000 weekly seats for Thai Airways (TG only) and about 12,500 weekly seats for Thai AirAsia (FD; other AirAsia affiliates excluded). In 2013, Thai Airways was the largest foreign carrier in Myanmar with slightly over 450,000 passengers carried (excluding the slightly over 30,000 passengers carried by Thai Smile), according to Myanmar DCA data. Bangkok Airways was the third largest foreign carrier, transporting 166,000 passengers and accounting for 6% of Myanmar’s international market. Thai AirAsia was the second largest carrier with 313,000 passengers. Bangkok Airways’ Myanmar traffic should surge in 2014 as most of the capacity it has so far added to the market was not added until late 2013. But the increase in traffic will likely lag the rate of capacity growth as the Myanmar market generally suffers from relatively low load factors. Even before the surge of additional capacity Bangkok Airways' load factors were relatively low. 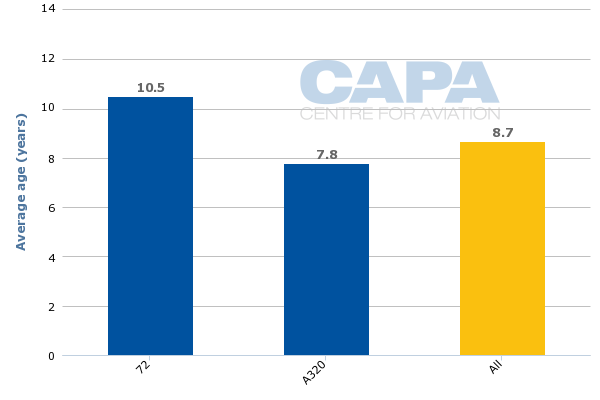 In 2013, Bangkok Airways carried only an average of 63 passengers per Myanmar flight, based on Myanmar DCA data. Load factor figures are not available as Bangkok Airways uses a mix of ATR 72s, A319s and A320s on its Myanmar routes. But as most of its Myanmar flights in 2013 were operated with A320s the load factor was certainly below industry norms. Bangkok Airways’ continued growth in Myanmar is strategic as the carrier looks to build market share in a market that over time will grow, allowing the capacity that has been added over the past year (and will be added in 4Q2014) to be absorbed. Bangkok Airways also has the yields to potentially be profitable on its Myanmar routes even with relatively low load factors as a large portion of its Myanmar traffic comes from codeshares and interlines with foreign full-service carriers. Bangkok-Yangon is already Bangkok Airways’ third largest international route after Bangkok-Siem Reap and Bangkok-Phnom Penh. The new Bangkok-Mandalay and Bangkok-Nay Pyi Taw routes also have been successful despite challenges faced by Thai Smile on Bangkok-Mandalay, which it has dropped for the current summer season, and by Thai AirAsia on Bangkok-Nay Pyi Taw, which it dropped entirely after serving for only a few weeks in late 2013. Bangkok Airways’ flexibility to use smaller aircraft – a mix of ATR 72s and A319s while AirAsia and Thai Smile only operate A320s – have helped the routes become quick successes. Business demand for Nay Pyi Taw, a very small city but Myanmar’s new capital, has particularly been strong as Myanmar is the chairmanship for ASEAN in 2014. A wide range of codeshare partners also has helped Bangkok Airways in all three of its existing Myanmar routes. For example its previously domestic-only codeshare with Japan Airlines was recently expanded to include Myanmar (as well as Cambodia and Laos) as the Japanese carrier is keen to improve its offline access to Myanmar. Bangkok Airways is well positioned to work with several foreign carriers in Myanmar as demand for services to Myanmar continues to grow. But the market is generally still too small to be served directly by carriers outside Asia. 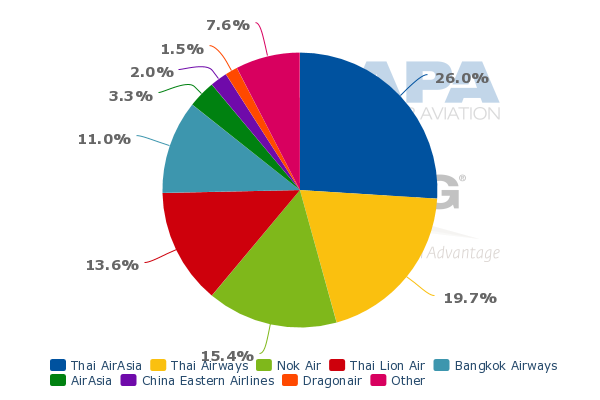 Nine of Bangkok Airways' 13 codeshare partners are airlines from outside Asia. Chiang Mai-Yangon and Chiang Mai-Mandalay is not a normal type of route for Bangkok Airways as it will have to rely almost entirely on local rather than connecting traffic. But these markets should be large enough to fill ATR 72s and are growing rapidly. The short distance – Chiang Mai is only about 350km from Yangon and about 450km from Mandalay but the journey by road is long and arduous – makes them ideal for turboprops. Chiang Mai and the northern Thailand region have a large Burmese community and is the base for several large non-profit organisations with projects in Myanmar. Bangkok Airways also sees some domestic expansion opportunities at Chiang Mai with new routes from Chiang Mai to Phuket and Udon Thani planned for late Oct-2014. Phuket will initially be served with one daily A320 flight while Udon Thani will be served with two daily ATR 72 frequencies. The combined three daily ATR 72 flights to Udon Thani, Yangon and Mandalay will be operated by the new turboprop base, with the Udon Thani flights operating in the early morning and late afternoon and the Myanmar flights operating in the late morning and early afternoon. Bangkok Airways has noticed a growing number of tourists combining Chiang Mai, a popular destination in northern Thailand, with Phuket, a popular beach destination in southern Thailand. The Chiang Mai-Phuket route is now only served by Thai AirAsia and Thai Airways. Chiang Mai-Udon Thani is a smaller niche route that is now only served by Nok Air and will complement Bangkok Airways’ Bangkok-Udon Thani route, which it launched in late 2013 using A320 family aircraft. Nok currently uses 737-800s on Chiang Mai-Udon Thani. Previously Nok offered multiple frequencies on the route using Saab 340 turboprops that were operated by Siam General Aviation (SGA) under the now defunct sub-brand Nok Mini. Nok ended its ties with SGA in Mar-2014, forcing it to drop several Saab 340 routes while up-gauging other Saab 340 routes to ATR 72s or 737-800s. Saab 340 routes that have been discontinued by Nok include Chiang Mai to Mae Sot and Mae Hong Son as well as Mae Sot to Yangon and Mawlamyine in Myanmar. Nok currently only operates two ATR 72-500s but plans to replace these aircraft with four Dash 8 Q400s, giving it the opportunity to potentially add back some of the turboprop flights that were previously offered under Nok Mini. The only mainstream turboprop operator in Thailand besides Nok and Bangkok Airways is Thai Lion Air. But Thai Lion currently only operates turboprop flights from Hat Yai in southern Thailand, where it has a one-aircraft ATR 72-600 base. Thai Airways and Thai AirAsia only operate jets but Thai AirAsia has been looking at establishing a regional operation, potentially in partnership with SGA. While Thailand’s domestic trunk routes have become intensely competitive, with a flood of new LCC capacity resulting in overcapacity, regional routes are relatively underserved despite rapidly growing demand. The opportunities in the regional market drove Thai Lion’s decision to add ATR 72-600s (its original business plan envisioned an all-737 fleet) and is prompting a model rethink at Thai AirAsia (the AirAsia Group has traditionally insisted on sticking to a singe aircraft type). As Thailand’s largest turboprop operator, it is logical for Bangkok Airways to respond by growing its ATR operation. While Thailand’s LCCs are in some cases well placed to stimulate demand on regional routes, these type of routes generally have the yields to support a full-service regional model. Bangkok Airways had been keen to reduce the size of its turboprop operation as it has seen it can be difficult from a marketing perspective to operate turboprops on routes that competitors serve with jets. But there are plenty of potential new routes which are only economical for turboprops and are not likely to see jet competition, giving Bangkok Airways new opportunities to use the turboprops that come off its jet routes. For example, Bangkok Airways has transitioned over the last couple of years almost all its flights to Cambodia from ATR 72s to A319s. Currently only one of its 10 daily flights between Bangkok and Phnom Penh or Siem Reap is still operated with the ATR 72, according to OAG data. Bangkok Airways also plans to up-gauge in late Oct-2014 one of its two daily flights to Luang Prabang in Laos from ATR 72s to A319s. A recent airport expansion enables Luang Prabang to accommodate jets, including A320s from rival Thai Smile. Bangkok Airways’ Bangkok turboprop base now mainly operates small domestic routes with limited or no competition such as Bangkok to Lampang, Sukhothai and Trat. Bangkok Airways also bases ATR 72s at Samui, which are used to serve Phuket, Krabi and U-Tapao as well as some flights to Bangkok. But as CAPA discussed in the first instalment of this series of analysis reports, most Bangkok-Samui flights have been up-gauged in recent years to A319s and all international flights at Samui are also now operated with A319s. The portion of turboprop flights at the Bangkok and Samui bases will continue to decrease as expansion is pursued primarily with A320 family aircraft. But the new Chiang Mai base shows there is still an opportunity to expand the overall size of the turboprop operation. The new Mandalay, Yangon and Udon Thani routes at Chang Mai are only viable with ATR 72s. Without the turboprop, Bangkok Airways is unlikely to pursue significant growth at Chiang Mai, which is the carrier’s fourth largest base or destination after Bangkok, Samui and Phuket. Chiang Mai is also Thailand’s fourth largest airport after Bangkok Suvarnabhumi, Bangkok Don Mueang and Phuket. Bangkok Airways currently serves Chiang Mai with seven daily A319/A320 flights, including six to Bangkok and one to Samui. Its Chiang Mai operation will grow to 13 daily flights from late Oct-2014, including eight daily flights to Bangkok, two to Udon Thani, one to Phuket, one to Samui and one to Myanmar (split between Yangon and Mandalay). The Chiang Mai expansion and new turboprop base also helps Bangkok Airways diversify its business, which is now heavily dependent on Samui and offering connections to foreign carriers at Bangkok Suvarnabhumi. The carrier has a strong niche and should be careful not to rock the boat too much and be cautious when considering expansion into other sectors. But expansion of the regional network and turboprop fleet is relatively low risk and could come with big rewards while staying true to Bangkok Airways’ overall boutique carrier model and strategy of staying out of the crossfire of Thailand’s intensifying LCC competition.